Roughly 69 percent of Americans between the ages of 35 to 44 have at least one missing tooth, while one in four people over the age of 74 have lost all of their teeth. Now, those with missing teeth have numerous options available to replace missing teeth in Waco. 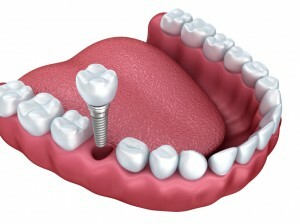 Among the most preferred option to resolve missing teeth is with dental implants. Dental implants permanently replace the tooth with a prosthetic. While dental implants are highly effective, they aren’t the only option. We offer various forms of tooth replacement in Waco to give you a complete smile and an improved quality of life. Dental implants offer a number of benefits that aren’t typically found with dentures. Since the replacement teeth are surgically implanted into the jawbone, they offer a strong biting force with no discomfort when eating and talking. With an increased biting force of roughly 70 percent when compared to dentures, you’ll be able to eat whatever you like without the fear of dentures slipping or falling out. Not to mention, since the implants are permanently held in place, there’s no need to worry about adhesives or the implants slipping when talking. In addition to improved quality of life, dental implants are also great for your oral health. When you have missing teeth, you begin to lose bone overtime. Dental implants will not only preserve your bone, but help stimulate new bone growth. This will allow you to maintain your natural facial structure for a completely beautiful look. You simply care for the implants just as you care for your natural teeth, including routine visits to your dentist. Overall, dental implants offer a comfortable fit and the most realistic thing next to your own natural teeth. As an implant dentist in Waco, we offer dental implant procedures to allow you to benefit from a wonderful new smile. We implant titanium posts into the jaw bone to act as tooth roots. Then, we will add the artificial teeth to restore your smile. Although dental implants are extremely beneficial, they can be costly. Dentures are a more cost effective option for tooth replacement in Waco. We offer full dentures and partials to resolve missing teeth. New advancements in dentistry now make dentures look more realistic to match your own natural teeth. Not to mention, they also provide enhanced comfort and function when compared to dentures used in the past. With a more custom fit, you’ll have an improved ability to eat and speak with confidence. Plus, you’ll prevent any additional complications threatening your oral health due to tooth loss. If you’re one of the many Americans suffering from tooth loss, fill the gaps in your smile with Premier Family Dental. We offer the solutions you need to replace missing teeth in Waco. We’ll evaluate your oral health and lifestyle to determine which is a better option for you—dental implants or dentures. No matter the option, we’ll create a beautiful and functional smile to last for years.